Foro de Educación is a space for a meeting of the minds between scientists and intellectual thinkers. In a manner of speaking, it is an arena where Education (with its distinguishing political, philosophical, cultural, social and economic features) and the processes of transference and international influences (characteristic of different places and times) can be examined and discussed. In addition, it is a channel – an avenue – for the dissemination of advances in the construction of knowledge about Education, and the contemporary debates about what educational theories, discourses and practices have been in the past, are at present and might come to be in the future. 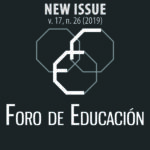 Foro de Educación is an open-access, peer-reviewed, academic publication, open and independent, issued twice a year. The journal’s primary objective is to publish research, studies and critical essays on Education, in whatever spatial- and temporal context, with perspectives that are theoretical, philosophical, political, sociological, anthropological, economic and/or comparative and international. All articles received by Foro de Educación for the “Monographs” and “Studies” sections are subject to double-blind external review. Foro de Educación accepts original submissions in a number of languages: English, Spanish and Portuguese. 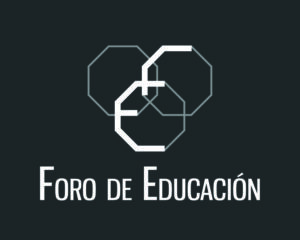 Foro de Educación is intended, mainly, for researchers, students and university teaching staff in Educational Sciences. We also welcome submissions from other free, independent operators, looking at issues of Intellectual Thinking, Culture, Society and Education, who are prepared to compare and contrast their own criteria and investigations with those of others.